IGOJA, an International Group Of Jewellery Artists, is a group of jewellery artist friends. The represented nationalities of the six jewellery artists in IGOJA are German, Dutch, English and Portuguese. Our purpose is to share our passion, to visit inspiring places together, and to exchange in workshops and to exhibit. September 2010. ‘Serendipity, chance favours the prepared mind’ was the title of this exhibition. Marlene Gerhard, from Germany, lives and works in Cologne in an old fire-station. She is trained as a goldsmith and jewellery maker in Idar-Oberstein, which is well known for its traditional jewellery industries and precious and non precious stones. After two years of working as a contract goldsmith she was slightly disappointed by the kind of work she was expected to do and started studying law for several years. However, the moment she came into contact with some inspiring jewellery artists who introduced her to several workshops, a completely new approach towards creating jewellery, her love for what she once started was back again. Suddenly everything made sense: she started to work again with different materials to create jewellery that is typical hers. Marlene has a very monumental approach which makes her work sculptural but this monumentality has lightness by its playfulness and humour. Hiltje Wynia, from the Netherlands has a studio in a Frisian village, Oudemirdum. She decided on a later age to develop her creativity in this field and began her studies in the Sculpture Department of the Academy of Art in Maastricht, but found out soon that the Jewellery Department suited her better. Suited is the right word, because Hiltje has a very developed sense for textile, clothes and jewellery. After her study she went back to her Frisian base in the north of the Netherlands where she created a series of jewellery made with and inspired by old traditional Dutch lace. Lace and the nature of the Frisian landscape, her love for gardening, all those things surrounding her makes an idea growing into her mind. Through the working process and a sometimes chaotic experimental struggle with materials the final outcome can be surprising in the end. These creative processes are what keep her love for making jewellery constantly evolving. artists. Suzanne grew up in an artistic surrounding; her father was sculptor and her mother a painter. She did choose for studying jewellery at the Academy of Art in Arnhem where she was taught by the famous Dutch designer Gijs Bakker. 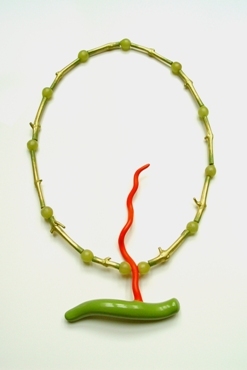 She developed a clear way of thinking and her jewellery is often based on form interventions. 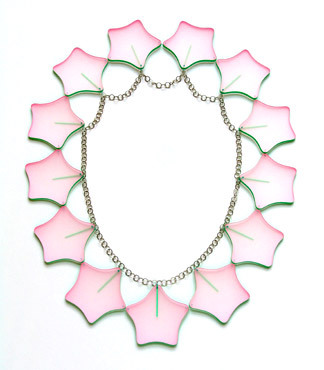 Her idea behind the piece is more important as its suitability as a wearable piece of jewellery but because of her love for repetition and regular rhythm her large necklaces are flexible and therefore by their very nature wearable. Her inspiration can come from elements of machinery; letting them grow as nature does; evolving into new spatial and monumental creations. this field. To be able to work alongside students she experiences is a privilege and an inspiration. Exchange programs brought her to several Asiatic countries where besides her teaching she could explore the culture. Recent inspiration from a visit to Korea include: exotic tied bundles of twisted roots to sacks full of dried flower heads and visiting temples in the wilds of the Korean mountains, she documents her travels with photography and sketches. In the studio she develops her collated research by drawing, abstracting, collage and three-dimensional models to develop and refine her jewellery. Susan’s work is as a big gesture in which you can find a resonance between her love for constructed textiles and textural details. passion can be the motivation behind these achievements. Birgit Laken, from the Netherlands, has her studio in the centre of Haarlem with a view on her garden. She studied drawing at the Royal Academy of Art in The Hague. Finding out that the direct way of expressing in drawing and painting was not the right way for her, she decided to do a second art study on the Gerrit Rietveld Academy in Amsterdam to become a jewellery artist. Working with metal and other materials required a complete different approach, having an idea, making a plan first, finding out how to treat the material, that indirect way of expressing enabled her to channel and express her passion. Being a spontaneous character she is always in search of balance which is reflected in her jewellery. Her work can be very clear, restrained and sober, but also it can be playful, particularly when expressed through colour. Birgit often develops her work through a themed project which can evolve and grow over a period of time; this takes her to a deeper understanding of the source that inspired her.